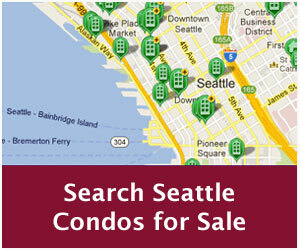 To say the Seattle condo market is a scorcher may be an understatement. 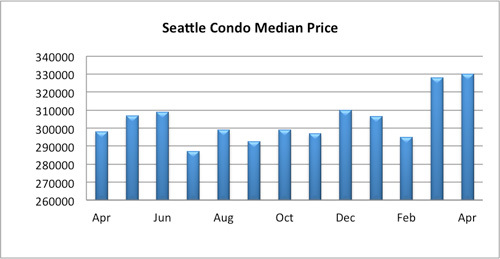 April’s steaming hot market figures are very reminiscent of the bubble years of the last decade, but with one significant difference, the severe lack of condo inventory. 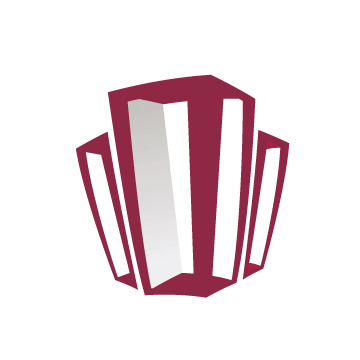 The citywide condominium median sales price rose to $330,000, reflecting a year-over-year (YOY) and one-month increase of 10.74% and 0.06%, respectively. It’s just shy of the all-time median high of $335,000 back in January 2009. Virtually, all areas of the city realized YOY improvement to sale prices and values with Capitol Hill, Queen Anne and West Seattle realizing double-digit increases. Though, downtown did see a slight dip of -0.8% for the period. 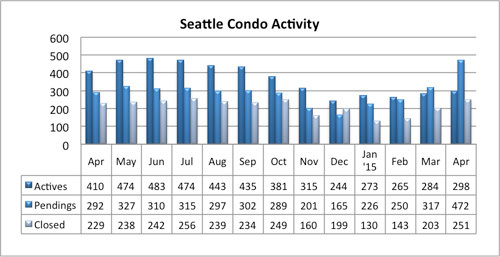 There was a little reprieve for buyers last month with 298 Seattle condo units for sale, marking a one-month increase of 4.9%, yet still 27.3% fewer than last April. However, the actual availability is a little higher when contemplating the still to be built/completed units at the three major condo projects (Insignia, Luma & Vik). Buyers seeking move-in ready homes are having a tough time. 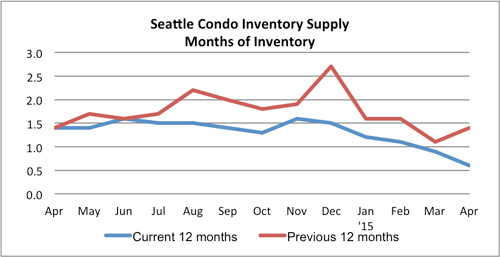 Seattle’s condo inventory supply rate sunk to 0.6-months of supply as demand far exceeds supply. Even during the height of the bubble, inventory was not this sparse. 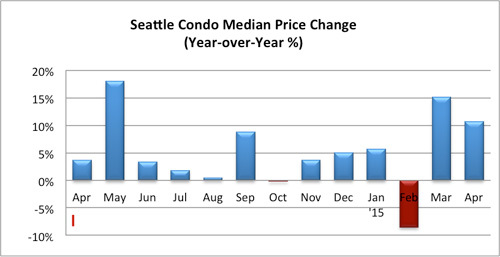 And, as a comparison, during the condo glut years (roughly 2007-2009) the supply rate was over 18-months. Although there were 298 units listed for sale in the MLS last month, 472 units went under contract (pendings), which reflected a whopping 61.6% increase compared to last April and 48.9% more than the prior month. The previous high was 442 pendings back in May 2007. How can more units be sold than were available you ask. Pre-sales made up a good chunk of that. Nearly 25% (117-units) of the 472 were pre-sale units. 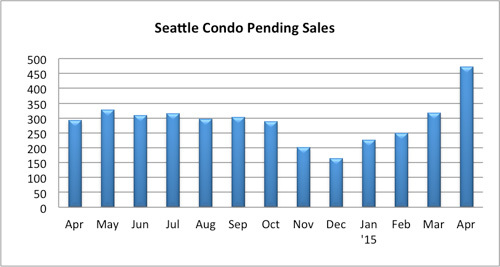 Even so, that left 355 pending resales relative to the 298 units listed. The bulk of the pre-sales will not be completed until 2016-2017, leaving a sizable condo inventory void for buyers looking for move-in ready units to call home. 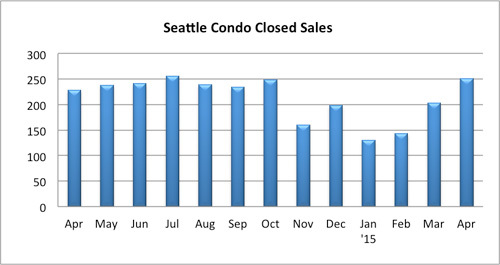 The number of closed Seattle condo sales also increased in April to 251 units marking a 9.6% YOY and 23.6% one-month improvement. There just aren’t enough condos available to satiate buyers’ voracious appetite. 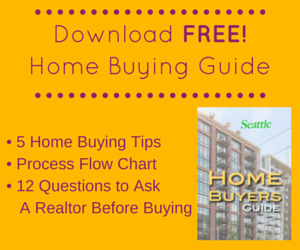 If you’re a buyer, you’ll need lots of patience and may find yourself at the losing end of multiple offer situations few times, or paying a little more before getting your very own piece of Seattle. Here are tips for buyer’s success in multiple bidding wars. If you’re a condo owner who’s been on the fence about selling or been bitten by the crash, it might be time to see if your home has appreciated in value, and offer some reprieve to ease the marketplace.